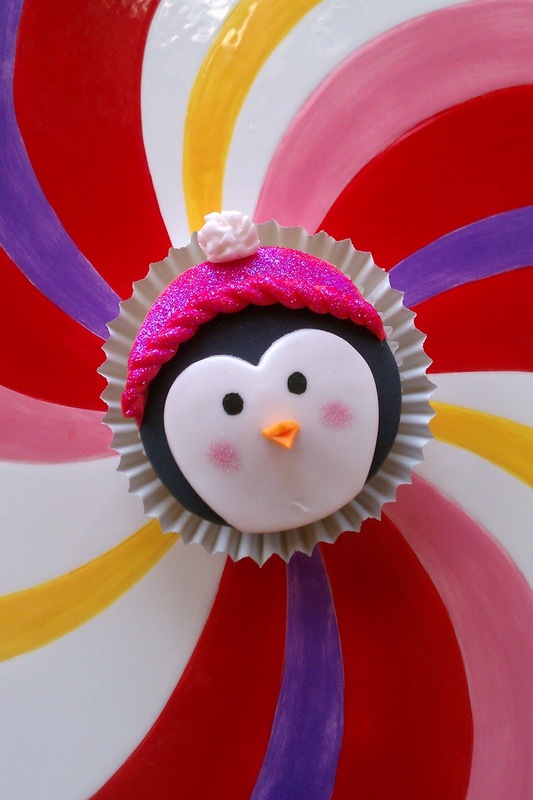 To say I love penguins would be an understatement, so I had to put some on my blog. I decided cupcakes would be the best way to go, and I’m delighted with how they turned out. I can’t help but smile when I look at them! Of course I had to give them sparkly hats, because thats what all penguins wear, right?! They’re perfect for holiday parties, and were pretty simple to put together too. For the cupcakes I used my vanilla cupcake recipe that I used in the Holiday cupcake tree. 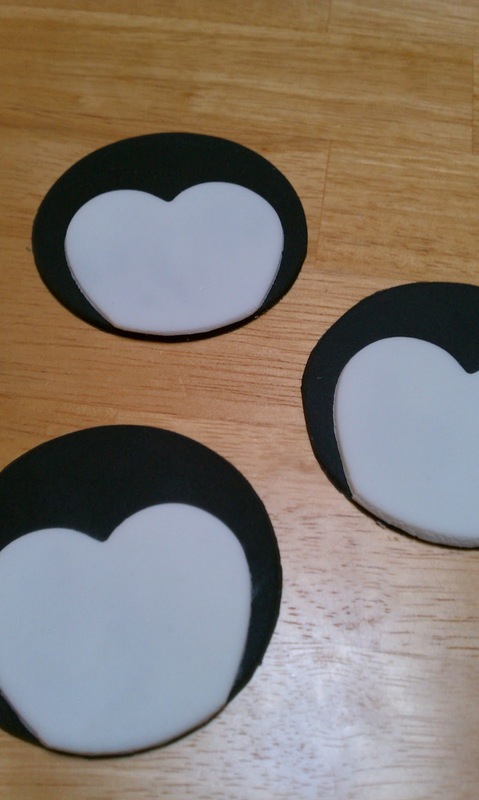 At first I thought they might be difficult to decorate, but then I looked at one of my many penguin dishes from Home Goods, and realized that the white part of the face was kind of heart shaped. That’s when it clicked! The first thing I did was color some fondant black. I rolled it out, and used a wine glass to cut out the circles. Next I rolled out white fondant and cut out hearts. I placed the hearts over the circles and trimmed the excess. I put a small amount of buttercream on each cupcake so the fondant had something to stick to, and placed it on top. To make their little beaks, I colored some fondant orange and cut out little triangles. I stuck two triangles together using a bit of water, and then adhered them to the face with another bit of water. Please note that you only need a dab of water to make fondant stick. I gave them eyes by just dotting a bit of black food coloring on with a paint brush. To get the rosy cheeks I used a paint brush to lightly dust on some orchid pink pearl dust. At this point they looked totally cute, but I needed to accessorize them! To make the hats I cut out circles of pink and purple fondant, and chopped the tops off. I gave them a little bit of detail on the trim and then brushed them with disco dust. The hats add that bit of sparkle every penguin needs, and takes them over the top. They’re almost too much for me to handle, almost! This penguin is my favorite! Color some fondant black & roll it out. 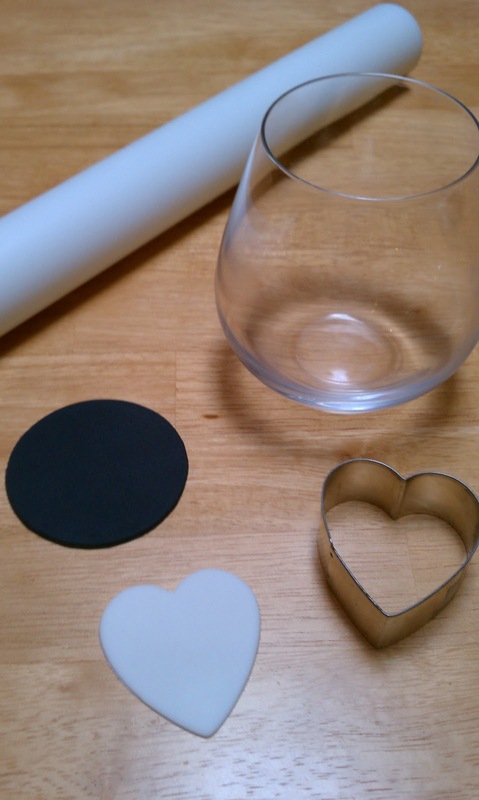 Using a 3″ ring mold or a wine glass, cut out circles. Roll out white fondant, and using a heart cookie cutter, cut out hearts. Place hearts on top of circles and trim excess. Place on top of cupcakes. Color small amount of fondant orange, and cut out little triangles. Press widest part of triangles together with a dab of water to form beak. Adhere beak to face with a dab of water. Use a paint brush dipped in black food coloring to dot on the eyes. Lightly brush on orchid pink pearl dust to give them rosy cheeks. Color more fondant pink & purple for the hats. Using the 3″ ring mold again, cut out circles. Chop the tops off & adhere them to the penguin. 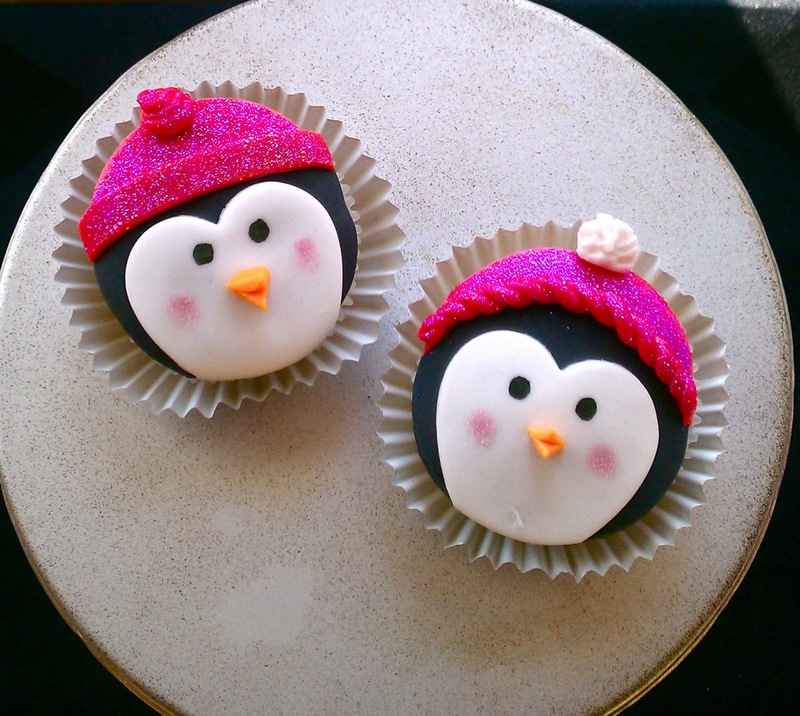 Add some detail by making little white pompoms out of fondant for the hats. Is disco dust the same as pearl dust..love these cuties…!!!! Thank you!! Disco dust is different than pearl dust. It is more sparkly and comes in bolder colors. These looks beautiful so ones I tried this at home they came so……………. I made these without the hats, perfect cupcake toppers!